The Rejoice! Quilting Collection contains quilting in the hoop designs to quilt the Rejoice! quilt - and all sorts of other quilts! 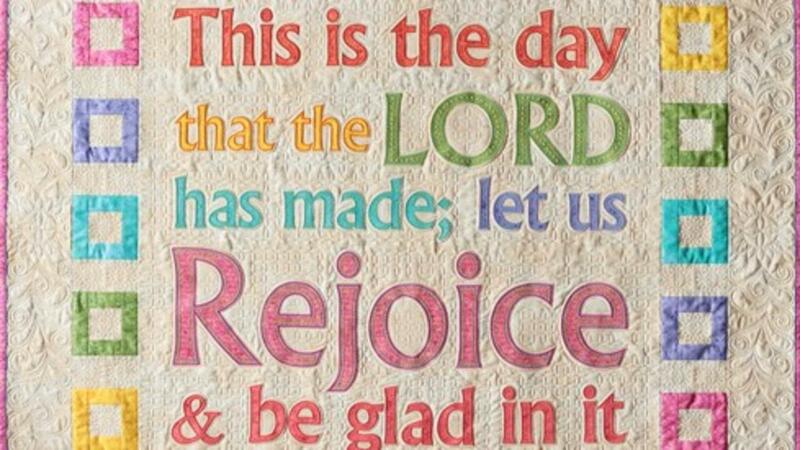 The Rejoice! Quilting Collection takes quilting in the hoop to new levels. A continuous feather design that comes in 3 sizes can be used to quilt borders that are 3", 4" and 6" wide, with repeats of 6", 8" and 12" respectively. When combined with the continuous wave design, the feather design creates a contemporary fill that will enhance even the simplest of pieced quilts. Detailed instructions to quilt the Rejoice! quilt using these designs. The Rejoice! Quilting Collection designs by can safely resized to fit the exact needs of your quilts.